We described structural features of the Glia-neuromuscular synapses in a novel Inside-out tissue preparation of live fly larvae using fluorescent dyes with confocal microscopy. We labeled live neuron terminals with fluorescent primary antibodies to HRP, and also visualized the perisynaptic space with fluorescent Dextrans. Brink, D., Gilbert, M., Auld, V. Visualizing the Live Drosophila Glial-neuromuscular Junction with Fluorescent Dyes. J. Vis. Exp. (27), e1154, doi:10.3791/1154 (2009). Our project identified GFP labeled glial structures at the developing larval fly neuromuscular synapse. To look at development of live glial-nerve-muscle synapses, we developed a larval tissue preparation that had features of live intact larvae, but also had good optical properties. This new preparation also allowed for access of perfusates to the synapse. We used fly larvae, immersed them in artificial hemolymph, and relaxed their normal rhythmic body contractions by chilling them. Next we dissected off the posterior segments of each animal and with a blunt insect pin pushed the mouth parts backward through the body cavity. This everted the larval body wall, like turning a sock inside-out. We completed the dissection with ultra-fine dissection scissors and thus exposed the visceral side of the body wall muscles. The glial structures at the NMJ expressed membrane targeted GFP under the control of glial specific promoters. The post-synaptic membrane, the SSR (Subsynaptic Reticula) in muscle expressed synaptically targeted dsRed. We needed to acutely label the motor neuron terminals, the third part of the synapse. To do this we applied primary antibodies to HRP, conjugated to a far-red emitting flurophore. To test for dye diffusion properties into the perisynaptic space between the motor neuron terminals and the SSR, we applied a solution of large Dextran molecules conjugated to far-red emitting flurophore and collected images. Our goal is a tissue preparation of fly larvae where the nervous system is intact, but the interior surface of the body wall muscle is exposed to an artificial hemolymph, and can be positioned close to a microscope cover slip for good optics. In other words, an inside out larval preparation. Since conventional tissue preparations involve cutting, pinning and stretching the body wall muscle, and sometimes removing part of the nervous system, we needed a different approach. We wanted the animals inside-out because we wanted to get a good look at structural features and structural changes over time in the synapse, and we wanted to keep the nervous system intact. We also wanted to avoid stretching the tissue, and activating stretch receptors, which would make the muscles twitch and ruin our images. For starters, stage the animals. Feeding third larvae and Wandering third larvae are big and easy to dissect so we'll demonstrate on W3 larvae. This animal is has the Tubby phenotype, and is wide, so it is easy to evert. We only used larvae that we saw actively crawling, including W3 larvae . Clean the surface of a maggot with a very soft paint brush in a petri dish of double-distilled H2O. Clean larvae have better optics and cleaning reduces bacteria. Transfer the animal to a small petri dish of about 3 ml ice cold HL-6, and artificial hemolymph. Put the dish on ice until the animal stops moving, and relaxes (about 5 minutes). Hold very fine tip forceps in one hand and spring scissors in the other. I use the scissors with my dominant hand. Make a small hole in the body wall with teh scissors to equlibrate the pressure across the body wall. Hold the animal gently with the forceps down on the bottom of the dish and cut off the posterior two segments. Dissect away the viscera and fat body will likely move out of the body cavity. Cut away this tissue also. Hold the larvae against the dish bottom with fine forceps. Hold a #0 insect pin in (with a blunt tip) and push it against the mouth parts of the larvae. Push the mouth parts through the body cavity like you are turning a sock inside out. The inside out tissue will look like figure: below. With ultra-fine dissecting tool, dissect away the fat body and trachioles from the body wall. Try REALLY hard not to pull the trachioles, or disconnect the nervous system. Ripping the trachioles will rip holes in the body wall muscle. Remove as much fat body as you can. Both of these structures disrupt the optical quality of your tissue. You may want to skip the coffee before doing this preparation. When you are finished the muscle will be translucent, not opaque or white. If you put the tissue prep into HL-6 without glutamate, at room temp, it will likely contract rhythmically because the motor pattern generators in the CNS are working. Avoid using preps with obviously contracted, or irregularly contracted body wall muscle. The intact inside out body wall readily tends to fold in half along the dorsal and ventral midlines, so the prep gives a left or right “hemi-animal” to visualize. 1.9 Mount the tissue in either a small volume commercial chamber, such as the Warner chamber, or a microscope slide with a bridged cover slip arrangement. See part 3 for suggestions on mounting tissue. Part 2: Neuronal Bouton Labeling with fluorescently labeled primary antibody against HRP. Put 50 micro liters of fluorescently labeled primary anti-body against HRP in HL-6 in a drop on a petri dish. Immerse the inside- out body wall prep in the dye bath. You may see neuron terminal labeling after about 5 minutes, but incubate for 10-20 minutes, for a complete and bright label. Rinse the dye off for 10-30 seconds in HL-6 at room temperature. Non-bound dye rinses off quickly, so the rinse cycle need not be aggressive. Vary the dye concentration and incubation time as needed. If you are not concerned about the timing of dye access into to your extracellular space, put a 20 micro liter drop of dye on a “bridged” coverslip (see part 4) and deposit the prep in the dye bath. Part 4: Mounting the tissue for visualization (with confocal microscopy). If you want to perfuse your prep, try using a perfusion chamber. We used a modified Chamber from Warner Instruments. Mounting prep on a double-bridged slide. Use a very clean microscope slide. Superglue two square, 18mm (#1.5) coverslips onto the slide. Leave a 2 mm gap between the edges of the coverslips. Let the glue fully dry, or it will form a weird film over the aqueous media around your prep. Position the inside out larvae between the edges of the coverslips. You may need to position the prep on a diagonal if the larvae is large and your image aquisition system has a limited pixel array. Cover the tissue with a # 1.5 coverslip, 18mm (very clean). Adhere the “top” coverslip the slide affixed tissue flanking slips, with minimal vaseline. Put a drop of Cargill custom objective oil with a refractive index of 1.3379 (if you use HL-6) on the top coverslip and flip this assembly over. Position the tissue assembly on your microscope, oil side toward the objective, and focus your objective. Mounting the tissue in a modified perfusion chamber. Glue a 1.5 coverslip to form a floor in the RC 20 chamber. Position the tissue in the chamber as per RC-20 instructions. Use a piece of Nytex mesh instead of a coverslip to form a roof for the chamber. W3 larvae, washed (“Tubby” phenotype)( 5.1.1). W3 larvae, posterior 2 segments dissected. You can see fat body pushed out of the body cavity by trans-body wall pressure (arrow). Try to minimize visceral “eruption” by making a small hole in the body wall 1 minute before dissection ( 5.1.2). The prep with the viscera dissected before turning the prep inside out (5.1.3). The prep, mostly everted, with the pin (arrow) inside the lumen of the prep (5.1.4). The muscle is now on the outside and the cuticle is on the inside, with some fat body and trachioles attached (5.1.5). A fully dissected tissue preparation with nearly all the fat body and trachioles dissected (5.1.6). 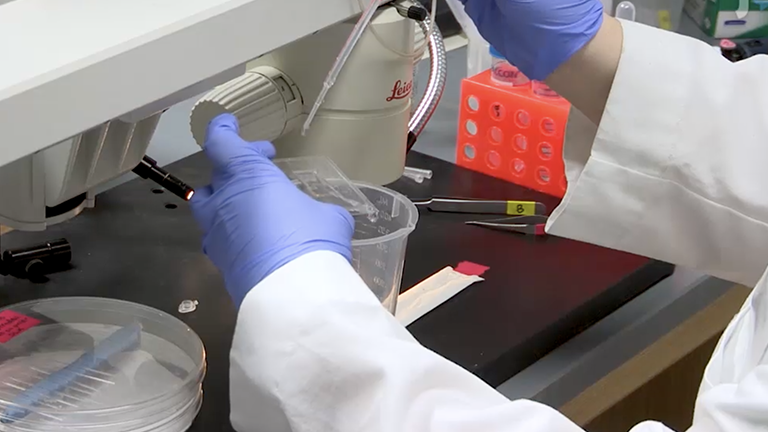 Live labeling using anti-HRP at the larval NMJ. A representative W3 larval nerve-muscle synapse with a glial extension (inside out-prep). The motor neuron bouton terminals are labeled with a primary anti-body against HRP (magenta), which is conjugated to Cy5. The glial processes are labeled with GFP (green). Perisynaptic space fluorescently visualized with Alexa 680 dextran in an inside out prep. The glial process (green) is labeled with membrane targeted GFP. The post-synaptic SSR on the muscle surface (blue) is labeled with dsRed. The Alexa dextran (red) forms concentrates in extracellular areas. The dextran dye forms doughnut shaped pools in the perisynaptic spaces. The dextran labeling and dsRed labeled SSR are shown in grayscale. Note the multiple doughnut shaped dye pools highlighting the perisynaptic spaces (arrow). This procedure permits long- term imaging of live labeled proteins and cell processes. The in situ tissue prep we described has an intact and functioning CNS, PNS and reflex circuits. 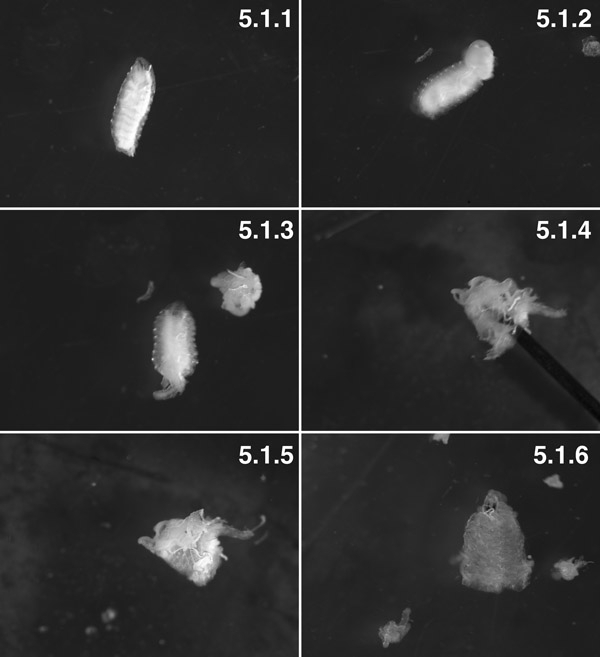 This tissue prep has advantages over standard larval fly muscle protocols, where the larval body wall muscle is stretched (when it is pinned out). Stretching can distort synaptic morphology and trigger reflex based contractions. Our inside out prep was mechanically stable, and had exceptionally good optics that facilitated high resolution analysis of cellular changes in real time. In addition the inside out preparation survived for up to an hour and allowed visualization of synaptic changes over a long time course. During dissection, take care to avoid damaging the PNS or CNS. Also avoid tearing or pulling on the tracheae as this damages the muscle cells. Keep the body wall muscle as relaxed as possible. Chilling the HL-6 and the tissue relaxes the body wall muscle and reduces trans-body wall tension. Calcium (2mM) in the in the artificial hemolymph is essential for the health and morphology of the glial cells. Imaging must be performed on stable, non-contracting muscle tissue. While 5 mM Glutamate efficiently blocks neurally evoked muscle contractions, the Calcium channel blocker Nifedipine may be a useful alternative. Nifedipine at 10 micromolar blocks most (but not all) nerve evoked muscle contraction. Nifedipine blocks voltage gated Calcium channels on the muscle cell membrane more effectively than channels associated with neurotransmitter release, thus blocking muscle contraction while permitting normal NMJ synaptic function (Morrales et al 1999). Using the antibody labeling procedure, we robustly labeled the extracellular carbohydrate residues expressed on neuron terminals, which are recognized by the anti-HRP primary antibody. We obtained excellent labeling using the anti-HRP antibody from Jackson labs, available pre-conjugated to a variety of fluorophores (Cy5- in our studies). This approach may be adapted for use with any primary antibody that recognizes an extracellular epitope, for example labeling extracellular matrix molecules. The in situ “inside-out” tissue preparation, coupled with a modification of the protocol used by Stork et al 2008, is useful for probing cellular diffusion barriers. Fluorescent dextran dye diffusion might also be useful for timing and visualizing perfusate and drug entry into inter-cellular spaces, such as synaptic clefts. With fluorescent dextran dyes, it is critical to use a small volume perfusion chamber. If there is too “thick” a boundary layer of dye solution covering the structure you seek to image, the dye solution may obscure the feature of interest, because of lack of contrast between dye infused spaces and the surrounding structures. Finally, our structural labeling techniques require a high resolution imaging system suitable for live tissue. We used spinning disc confocal microscopes (Quorum technologies and Perkin- Elmer systems) in conjunction with Volocity software (Improvision); a long working length, high numerical aperture 63X water immersion lens; and lasers and filters appropriate for visualizing GFP, dsRed and far red fluorophores. For imaging we used custom formulated microscope objective oil from Cargill labs to match the refractive index of the artificial hemolymph, HL-6, in conjunction with the 63X water immersion lens. Without this oil, refractive error was significant and resulted in distorted images. Our in situ preparation might be used with other 3-D imaging systems, such as the API DeltaVision Scanning Restoration system. However, care must be taken to overcome the high levels of light scatter from the thick, live tissue preparation. This project was funded by the CIHR and NSERC. We would like to acknowledge Barb Jusiak for contributing to the creation of the fly strains expressing dsRed labeled SSR (BJ line), and the UBC Bio-imaging Facility. Alexa 647 antibody labeling kit Reagent Molecular Probes, Life Technologies A10475 We prepared a total of 80 micro liters of conjugated primary antibody, and stored as 2 microliter aliquots. We diluted each aliquot into 100 microliter of HL-6 for labeling. Macleod, G. T., Marin, L., Charlton, M., Atwood, H. L. Synaptic Vesicles: Test for a role in presynaptic Calcium regulation. J. Neurosci. 24, 2496-2505 (2004). Macleod, G. T., Hegstro, M., Wojtowicz, M., Charlton, M. P., Atwood, H. L. Fast Calcium signals in Drosophila motor neuron terminals. J. Neurophysiology. 88, 2659-2663 (2002). Morales, M., Ferrus, A., Martinez-Padron, M. Presynaptic calcium-channel currents in normal and csp mutant Drosophila peptidergic terminals. Eur J Neurosci. 11, 1818-1826 (1999). Stork, T., Engelen, D., Krudewig, A., Silies, M., Bainton, R. J., Kla¨mbt, C. Organization and Function of the Blood–Brain Barrier in Drosophila. J. Neurosci. 28, 587-597 (2008). Beautiful images. It would be great to see some data on how mobile the glial cell processes might be, and what mobilizes them. From watching the video, you indicate that some of the glial cell precesses run deep in the SSR, is this right? Can you refer me to any published electron microscopy that might show this?